Hayman Distillers, the English gin distiller, is opening a dedicated distillery in Witham, Essex, bringing distillation to the same location as blending and bottling. The company says volumes have grown considerably over the past few years and this has allowed it to bring its distilling in-house. The opening of the distillery also marks 150 years since James Burrough, great grandfather of the current chairman Christopher Hayman, bought his first still and started distilling Gin. Like previous generations of the family, Hayman’s dedicated still is a traditional copper pot still, which is known to produce the finest gins. The 450-litre still has been handmade by Carl, a family-run business that has been making stills in Germany since 1869. Hayman’s still has been named ‘Marjorie’, after Christopher Hayman’s mother, who was the granddaughter of James Burrough and the person who introduced Christopher to the family business and to the gin industry. Marjorie died at a young age and the name was chosen by Christopher in his mother’s memory. Christopher Hayman, Hayman’s chairman, says: “We are delighted to be unveiling our own dedicated still, ‘Marjorie’, at our distillery in Witham. Had my mother been here today, I know she would have been very proud of the work we have put into opening the distillery. The company is now run by the fifth generation of the Hayman family, James and Miranda Hayman, with Christopher Hayman as chairman. Hayman’s produces a range of six different styles from the gin family. These follow the evolution and history of gin over the last 150 years. The new branding features across the core range of Hayman’s London Dry Gin, Hayman’s Old Tom Gin and Hayman’s Sloe Gin as well as Hayman’s Royal Dock Navy Strength. The rest of the range, including Hayman’s 1850 Reserve and Hayman’s Gin Liqueur will follow soon. The Hayman’s range of gins is distilled to individual family recipes from carefully selected botanicals and is availably globally. Hayman is a family company dating back to 1863. The original family company was bought by James Burrough, who is the great grandfather of chairman Christopher Hayman. James Burrough Ltd consisted of a Fine Alcohols Division and a Drinks Division with a portfolio of Gin and Vodkas, most notably Beefeater Gin. Christopher Hayman, the current chairman, joined James Burrough Limited in 1969 and was responsible for the distillation and production of Beefeater until 1987. 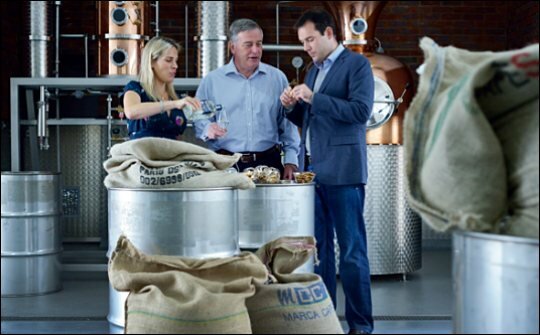 Although James Burrough Limited was sold to Whitbread in 1987, Hayman’s retained part of the business and Hayman Distillers continues the tradition of distilling and producing fine spirits. Hayman’s Gin was previously distilled at Thames Distillers. Hayman’s has a 20% ownership and this will be retained. UK RRPs are as follows: Hayman's London Dry Gin £21.00; Hayman's Sloe Gin £19.50; Hayman's Old Tom Gin £22.50; Hayman’s 1850 Reserve Gin £26.00; Hayman’s Gin Liqueur (50cl) £19.90; Hayman’s Royal Dock Gin £26.25. The Hayman’s range is distributed in the UK by Love Drinks.